I’ve mentioned before the considerable taxonomic challenges facing students of the family Buprestidae (jewel beetles) in North America, owing largely to fact that more than half of its species are assigned to one of just three hyper-diverse genera (Acmaeodera, Agrilus, and Chrysobothris). New species continue to be described, but the most recent comprehensive treatments of these three genera were published more than 60 to 100 years ago (Fall 1899, Fisher 1928, Fisher 1945)! 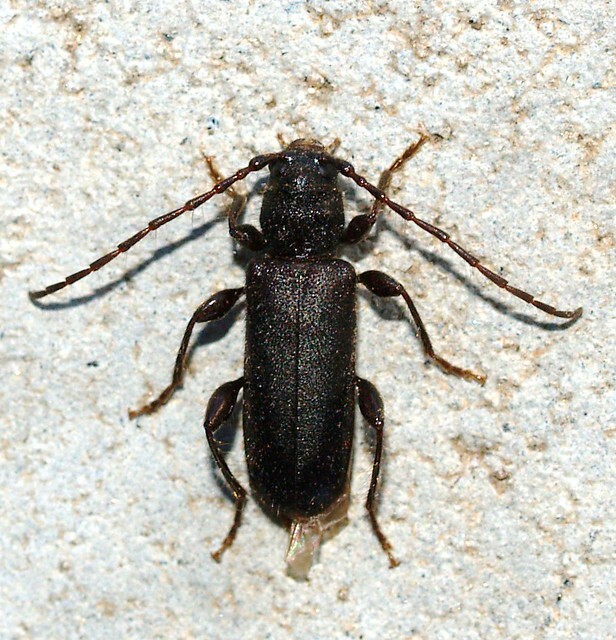 The situation is not as dire in the “other” major woodboring beetle family – the Cerambycidae (longhorned beetles), thanks in great part to the efforts of Gorton Linsley and John Chemsak and their monographic series of the family’s North American species (Linsley 1961-1964, Linsely and Chemsak 1972-1997). Although somewhat more speciose in North American than the Buprestidae, diversity in the Cerambycidae is more apparent at the generic level (1000+ species in 325 genera, compared to 787 species in only 54 buprestid genera). This does not mean, however, that the Cerambycidae lacks problematic, speciose genera, and in a recently published paper, Ian Swift and Ann Ray (2010) tackle one of these – the genus Phymatodes. While no new species are described, their treatment does propose numerous nomenclatural changes based on examination of type specimens that affect several North American species, including correcting misapplied names and recognizing multiple synonymies. These problems resulted from the practice of many earlier authors who did not examine type specimens when describing new species, relying instead only on written descriptions to compare taxa. Phymatodes blandus is no longer divided into subspecies, with P. blandus concolor now being recognized as a full species. The name Phymatodes decussatus has been used for the wrong species, which is actually P. obliquus. It is distinct from true P. decussatus, which has until now been called P. juglandis. The subspecies formerly placed under P. decussatus are also synonymized under P. obliquus. Linsley (1964) confused things by applying the name decussatus to this common, oak-associated species and the name juglandis to the species associated with walnut. The type of decussatus, however, matches the walnut species and, since it is the older name, takes priority. The common oak species is thus left without a name, and obliquus is the oldest of the many synonyms created by Thomas Casey. Phymatodes hirtellus is no longer divided into subspecies. Phymatodes lecontei is synonymized under P. grandis. Phymatodes mojavensis is synonymized under P. nitidus. Phymatodes oregonensis is synonymized under P. nigrescens. Phymatodes ursae is synonymized under P. hirtellus. While this paper is not a full revision of the genus, it does include diagnostic and comparative notes, full color dorsal habitus photographs (example plate below), and an updated key to all of the species found in North America. PLATE 1. 1) Phymatodes aeneus, male; 2) P. aereus, female; 3) P. amoenus, female; 4) P. amoenus, female ventral; 5) P. ater, female; 6) P. ater, female; 7) P. blandus, male; 8 ) P. concolor, male; 9) P. decussatus, male. © Swift & Ray 2010. Phymatodes lividus (Rossi, 1794) – introduced to eastern U.S.
Fall, H. C. 1899. Synonpsis of the species of Acmaeodera of America, north of Mexico. Journal of the New York Entomological Society 7(1):1–37 [scroll to “Journal of the New York Entomological Society”, “v. 7 1899”, “Seq 12”]. Fisher, W. S. 1942. A revision of North American species of buprestid beetles belonging to the tribe Chrysobothrini. U. S. Department of Agriculture, Miscellaneous Publication 470, 275 pp. Linsley, E. G. 1961. The Cerambycidae of North America. Part I. Introduction. University of California Publications in Entomology 18:1–97. Linsley, E. G. 1962. The Cerambycidae of North America. Part II. Taxonomy and classification of the Parandrinae, Prioninae, Spondylinae and Aseminae. University of California Publications in Entomology 19:1–102. Linsley, E. G. 1962. The Cerambycidae of North America. Part III. Taxonomy and classification of the subfamily Cerambycinae, tribes Opsimini through Megaderini. University of California Publications in Entomology 20:1–188. Linsley, E. G. 1963. The Cerambycidae of North America. Part IV. Taxonomy and classification of the subfamily Cerambycinae, tribes Elaphidionini through Rhinotragini. University of California Publications in Entomology 21:1–165. Linsley, E. G. 1964. The Cerambycidae of North America. Part V. Taxonomy and classification of the subfamily Cerambycinae, tribes Callichromini through Ancylocerini. University of California Publications in Entomology 22:1–197. Linsley, E. G. and J. A. Chemsak. 1972. The Cerambycidae of North America. Part VI, No. 1. Taxonomy and classification of the subfamily Lepturinae. University of California Publications in Entomology 69:viii + 1–138. Linsley, E. G. and J. A. Chemsak. 1976. The Cerambycidae of North America. Part VI, No. 2. Taxonomy and classification of the subfamily Lepturinae. University of California Publications in Entomology 80:ix + 1–186. Linsley, E. G. and J. A. Chemsak. 1984. The Cerambycidae of North America, Part VII, No. 1: taxonomy and classification of the subfamily Lamiinae, tribes Parmenini through Acanthoderini. University of California Publications in Entomology 102:ix + 1–258. Linsley, E. G. and J. A. Chemsak. 1995. The Cerambycidae of North America, Part VII, No. 2: taxonomy and classification of the subfamily Lamiinae, tribes Acanthocinini through Hemilophini. University of California Publications in Entomology 114:xi + 1–292. Linsley, E. G. and J. A. Chemsak. 1997. The Cerambycidae of North America, Part VIII: bibliography, index, and host plant index. University of California Publications in Entomology 117:ix + 1–534.. Swift, I. P. & A. M. Ray. 2010. 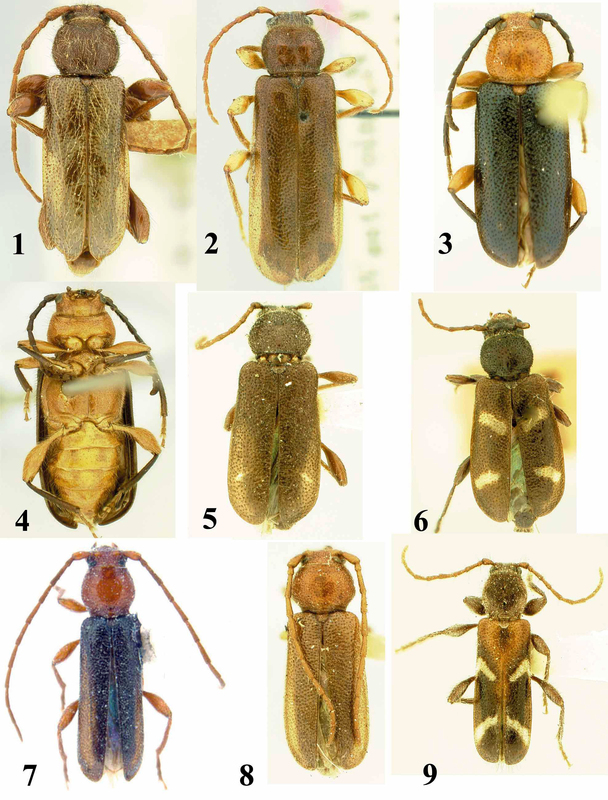 Nomenclatural changes in North American Phymatodes Mulsant (Coleoptera: Cerambycidae). Zootaxa 2448:35–52. This entry was posted in Cerambycidae, Coleoptera and tagged beetles, literature, longhorned beetles, nature, taxonomy. Bookmark the permalink. None from AZ so far. Elusive! I don’t even have that specimen…. Hi Margarethe – yes, P. lecontei is now P. grandis. Your photo seems to be private, so I couldn’t view it. I’ve gotten most of my specimens of species in this genus by rearing them from their host plants. Sorry about the photo settings – I’ve changed them now, if you are still interested. Nice photo. I would indicate synonymy as: Phymatodes grandis (= P. lecontei). I can contribute some specimens of P. obliquus to your cabinet; they are quite common out here and I get them in my pheromone traps. And thank you very much for the nice write up. You’re welcome, Annie – and thank you for any P. obliquus you can send. Let me know if you need mailing address info.